Our home is situated on a beautiful hillside surrounded by New England forest. We purposefully built with large expanses of windows to the south and east to make the most of the winter sun and the shaded views. 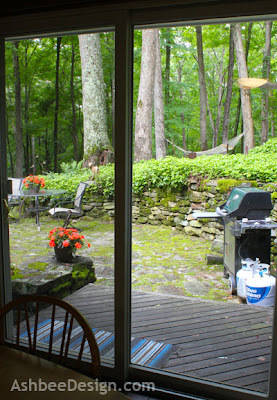 But when you gaze out through the patio slider from the kitchen the view is marred by the gas grill. I consider this a design fail in need of intervention! My next project is to build some type of divider to place on the stoop corner to visually hide the gas grill from view. I have been collecting ideas and am thinking of several different approaches. This is one of those posts sharing my thought process. Here is my brainstorming displayed via blog. 1. There is almost no sunshine in this corner during the summer or else I would have some sort of vertical herb garden here. 3. I've tried large containers of Coleus but the fungus gets them every time, and it isn't a winter solution. 1. I have always loved this hat rack made of branches. Use your imagination now. Think about 3 vertical panels, different heights, but just tall enough to visually block the grill. On the window side I would leave some branches as hooks. I'd hang small planter pots with Ivy in the summer and maybe put pine boughs and red berries in them in the winter. 2. Or possible a trio of driftwood trees, one tall and two shorter ones. 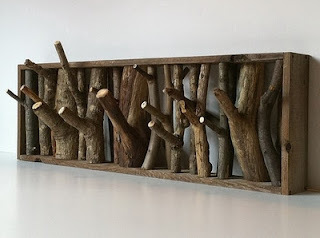 The problem with this idea is a shortage of driftwood. Maybe a trip to the beach is order! 3. 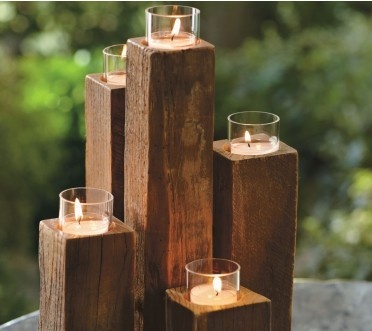 A third possibility is a variation on this candle centerpiece. Imagine all these longer, in a row about three deep, in staggered heights with a place for small candles in the tops. We have 3 long lengths of well weathered 4x4 posts leftover from the old volley ball net. I could recycled that material although there may not be enough. 4. 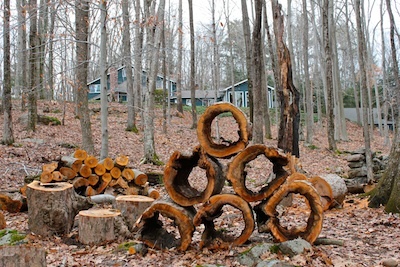 Or maybe this might be a good location for the hollowed maple stumps leftover from the harsh fall storms. These beauties are currently stacked as a pyramid at the foot of our front hill. The challenge here would be finding a chain saw big enough to safely cut cut smaller slices. These are currently so huge they would dwarf the deck! Choices, choices. In all of them you can see my love of wood! Which idea do you think has the most potential? 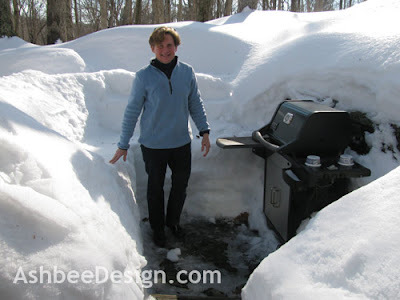 And how do you hide your gas grill? I like ideas #1 & #3! I would lean more towards #3 because it seems to have more versitality for your neck of the woods. Down here in OK, I don't have need to hide my grill, as it doesn't distract from my view. Your view however is gorgeous and I think you've got the right idea!! 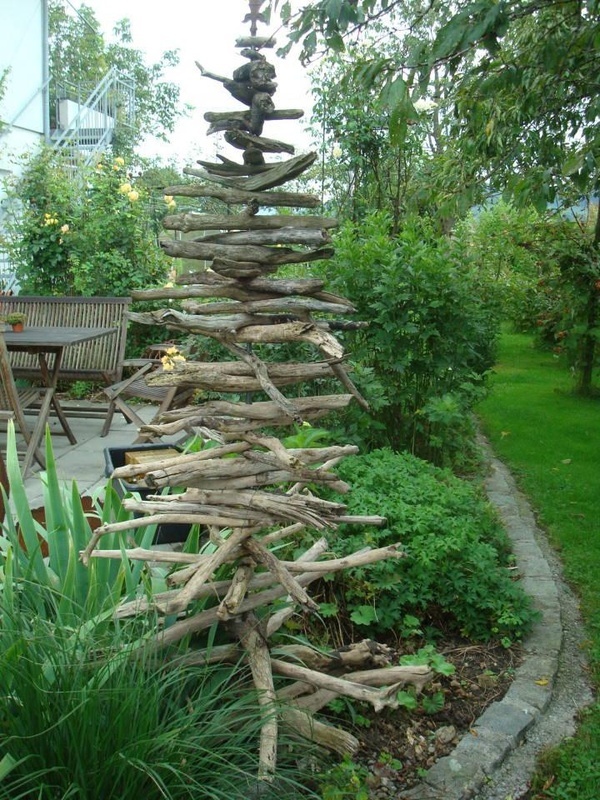 #3 has that natural cozzy feel to it and can be decorated for any season. Bunting for the 4th (with candles on top), small gourds on top for fall, evergreen swag (and candles) for winter.....the list is endless....and making it just high enough to cover the grill is a genius idea! LaNae, What wonderful feedback. It inspires me to not let this get put off. y husband agrees with choices 1 & 3 but likes 1 better. I think I can incorporate variations for the seasons with that one as well. I need to start collecting forked branches. Thanks for commenting and I'll keep you posted on my progress.